On paper, bike messengering represents the very worst of post-industrial employment. The work is physically demanding and it pays very little. For around $100 a day (sometimes more, often times less) messengers must careen through gridlocked traffic, breaking traffic laws, and risking their own safety in order to deliver the advertising proofs, architectural blueprints, and legal documents that circulate in the downtown cores of major cities. Injuries are common; workers compensation and medical coverage are rare. At the same time, many bike messengers transform their job into an all-encompassing lifestyle, which is the focus of my book Urban Flow: Bike Messengers and the City. Even when they are not working, these men and women are still riding around the city on their bikes. They spend their free-time socializing primarily with other messengers, and they take great pride in their urban cycling prowess. The most poignant examples of the messenger lifestyle are events called alleycat races. Organized at the grassroots level, with minimal prizes for wining, alleycats replicate the messengers’ work, but strip it down to emphasize the most fast-paced and dangerous aspects. They are major social events in the messenger community. Alleycats often take place in cities, through regular traffic, without any official permit, but they are also organized as larger regional and global events, with many messengers travelling across the country and around the globe to meet and compete against other messengers in such races. Why would a low-paying and dangerous job inspire people to spend their own money to travel to an event that subject individuals to the hardest, riskiest parts of their workday? Really, why would messengers celebrate (in their free-time no less) the very things most workers attempt to avoid? Within the organizations, occupations, and work literature questions like these form a common theme. Why do workers work as hard as they do? Why do some people willingly take risks in their labor? How do workers in stigmatized and dangerous occupations maintain positive self-conceptions? And, we have a lot of answers. In particular, sociologists have focused on the various ways organizations and peer-groups help shape vocabularies of motive and frame otherwise negative activities as something valuable for the individual. Vocabularies of motive and framing, however, are not adequate explanations for why there is a bike messenger lifestyle. To understand bike messengers and their subculture we need to turn to sociologist Stephen Lyng’s concept of edgework. Edgework (at least in Lyng’s original iteration) is about intentionally entering life-threatening situations for the thrill of surviving them. It is in these life-or-death moments that the required roles of our everyday lives (and our self-reflexive thoughts about them) disappear from consciousness. To put it in the terms of classical social psychologist George Herbert Mead, the spontaneous actions of the “I” obliterate the socialized constraints of the “me.” To successfully work the edges of survival can be a satisfying and meaningful experience. After all, it’s hard not to find meaning in actions that keep you alive. In a word, such actions feel… authentic. Indeed, Lyng uses the concept of edgework to explain why people living in an increasingly safe and rationalized world seek out dangers (e.g., motorcycle racing, mountain climbing, and skydiving). It is worth noting that Lyng’s emphasis on the “I” in producing meaningful experiences is similar to sociologist Robert Dubin’s concept of central life interest. Both Lyng and Dubin argue for the importance of creative and spontaneous action in feelings of authenticity. A lawyer, for example, can find satisfaction and meaning in her labor because she has control over numerous aspects of her job, and she is given the agency to make decisions with uncertain outcomes – i.e., she uses her skills to take and overcome risks (for more on professional autonomy, see a recent OOW blog post). Edgework, however, focuses on the most extreme aspects of this process; the uncertainty is existential. Moreover, Lyng’s work underscores the corporeal aspects of meaning making. Edgework is not a set of rational calculations, nor are the sensations of it something easily put into words. Edgework is something lived through the body. Embodied and filled with emotion, the experiences of pushing the edge have an unquestionable verisimilitude. To the extent that edgework is possible in our lives, we are most likely to find it in our leisure time pursuits. What bike messengering does is allow for edgework to become part of the workday. In making their deliveries, messengers can continually push the edge as they navigate the ever-shifting maze of urban traffic. The faster a rider pedals and the tighter the spaces he slips through the more challenging (and, thus, more thrilling and satisfying) the work becomes. Alleycats, in essence, are rituals (in the full Durkheimian sense) that transform such risk-taking into something deeply profound for the messenger, and these events form the basis of a bike messenger subculture. The edgework perspective, however, is not without its critics. Matthew Desmond contends (quite rightly) that sociologists are mistaken when they theorize all individuals engaged in dangerous activities as wonton thrill-seekers. Desmond shows that wildland firefighters, while routinely (and proudly) placing themselves in harm’s way, do not valorize the risks involved in their work. They value safety and hard work, not brazen heroics. For Desmond, the key to understanding why workers willingly engage in dangerous labor comes down to the organizational context of employment and the social context of the individual workers. Desmond is clearly on to something, but it is important not to throw the baby out with the bathwater. The concept of edgework does not necessitate an assumption that all risk-takers are brash adrenaline junkies, nor does it rule out the importance of organizational and social context in how danger is understood and acted upon. What the edgework perspective does allow for is a social psychological analysis that takes the body and emotions seriously. For many people, work is little more than a four-letter word. It represents dissatisfaction and drudgery. Messengers, though, like their job, and this is despite the objectively miserable conditions of the labor (i.e., the strenuousness and dangerousness combined with low pay and little in the way of job security). In fact, many messengers would go so far as to say they love their job. There is an organizational context for this and messengers are certainly socialized in ways that help positively frame the risks and hardships of the occupation. But, understanding how careening through traffic allows for creative and spontaneous actions, understanding how pushing the edges of survival allows for a sense of authenticity, and acknowledging that meaning is often something lived emotionally through bodily experiences is equally important. As sociologists interested in people and their work, we need to explore the structural and the social psychological aspects of labor. Of course, for most of us, our job tasks don’t have much potential for being transformed into edgework. However, studying those people who can push the edge for pay is a valuable (but underappreciated) avenue of inquiry. With bike messengers we see individuals who blur the usual distinctions between work and leisure, and there is evidence that others in physically risky occupations (e.g., athletes, firefighters, and police officers) do so as well. To what extent is the meaning people find in such work related to the social psychological process described by Lyng? Moreover, how does edgework relate to issues of alienation? In the case of bike messengers, we see workers who feel anything but alienated; they feel invigorated by their labor. In many respects, considering the positive affects of risk-taking refocuses how quality work environments can be assessed. Which is to say, safety and higher wages are not necessarily the best methods of achieving worker satisfaction. These questions (and many more) are empirical and theoretical matters requiring further research. Jeffrey L. Kidder is Assistant Professor of Sociology at Northern Illinois University. His research investigates how individuals find meaning in their everyday lives. 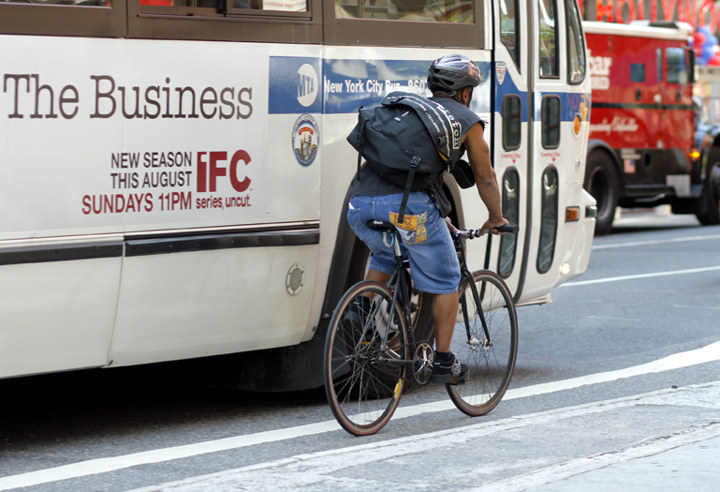 His recent book Urban Flow: Bike Messengers and the City investigates the world of urban bike messengers. Quicksilver! OK – I just had to blurt that out, but I really enjoyed reading this post.